Generates a signal containing an arbitrary wave. 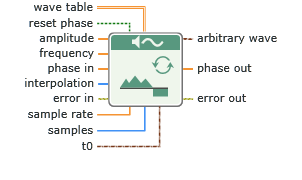 One cycle of the waveform used in creating the output arbitrary wave. The initial phase of the arbitrary wave. Sets the initial phase to phase in and sets the initial time to t0 if you configure this node to return a waveform. Sets the initial phase to phase in if you configure this node to return a double-precision, floating-point number or an array of double-precision, floating-point numbers. Uses the values of phase out and t0 from when the node last executed as the initial phase and time of the wave if you configure this node to return a waveform. Uses the values of phase out from when the node last executed as the initial phase of the wave if you configure this node to return a double-precision, floating-point number or an array of double-precision, floating-point numbers. Amplitude of the arbitrary wave. Frequency of the arbitrary wave in normalized units of cycles/sample. The initial phase, in degrees, of the arbitrary wave. phase in is valid only when you set reset phase to True. The type of interpolation this node uses to generate the arbitrary wave. Sample rate in samples per second. Number of samples in the signal. samples must be greater than 0. Otherwise, this node returns an error. This input is available when you configure this node to return a waveform or an array of double-precision, floating-point numbers. Timestamp of the output signal. If this input is unwired, this node uses the current time as the timestamp of the output signal. This input is available only if you configure this node to return a waveform. Phase of the signal in degrees. where a is amplitude and n is samples.